East Coast/West Coast/North Coast: Wind and Waves: A Long Island Nor'easter! 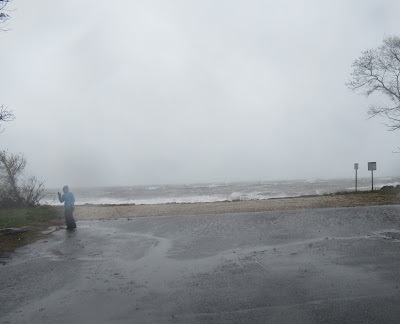 Wind and Waves: A Long Island Nor'easter! 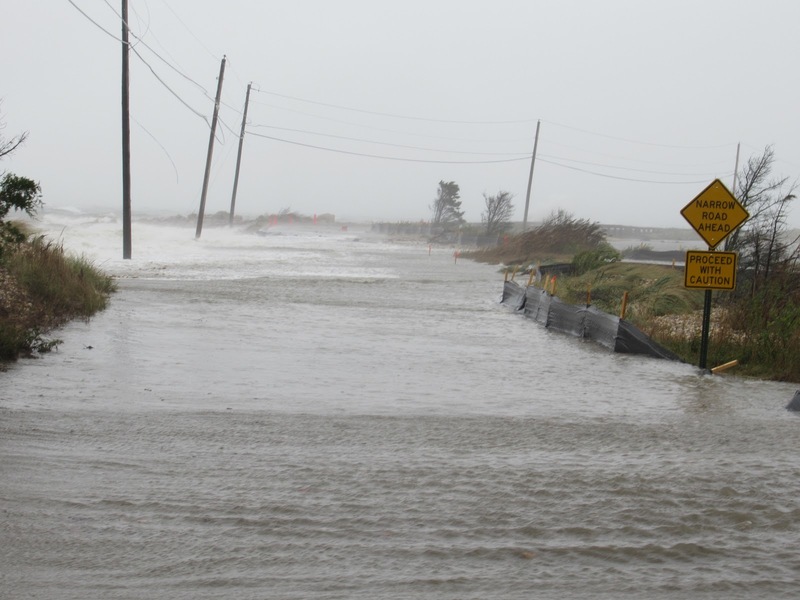 Although a Nor‘easter is a storm not as well-known as its cousins the hurricane, typhoon and tornado, it can still pack a wallop. In fact, according to Montauk’s Greg Donohue, who wears the hat of Director of Erosion Control to protect the Montauk Lighthouse, that 1991 storm immortalized in Sebastian Junger’s book, The Perfect Storm and the movie of the same name was a Nor‘easter. Nor’easters usually develop in the latitudes between Georgia and New Jersey, within 100 miles east or west of the East Coast. These storms progress generally northeastward and typically attain maximum intensity near New England and the Maritime Provinces of Canada. They nearly always bring precipitation in the form of heavy rain or snow, as well as winds of gale force, rough seas, and, occasionally, coastal flooding to the affected regions. 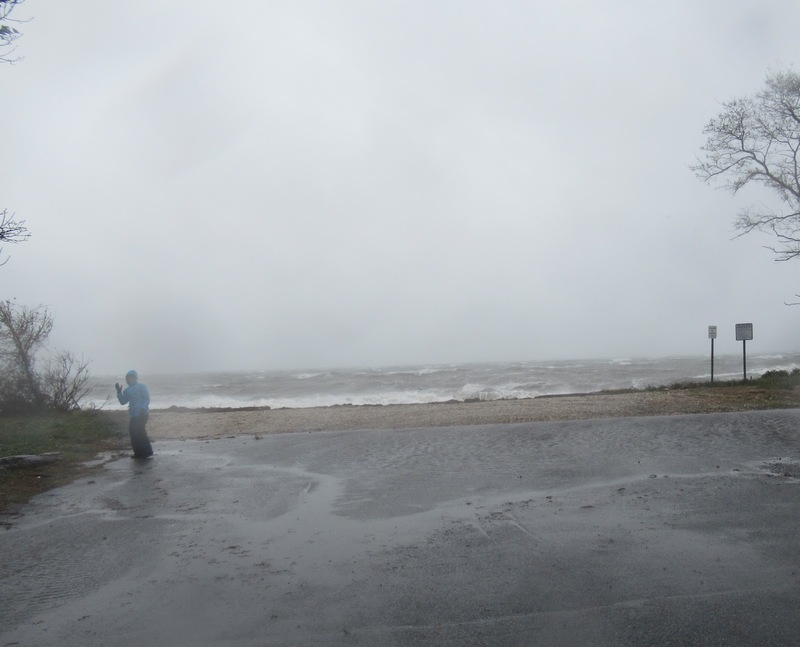 A recent family visit to Long Island put me in the path of a particularly strong Nor’easter on Saturday October 27, 2018. Thanks to modern weather forecasting techniques, meteorologists can see a storm coming well in advance. On Friday, October 26th, while all the television stations were working themselves into a lather about the storm, the weather and water on Long Island was calm. In the Springs neighborhood on the South Fork, the main sign of the impending storm was that a contractor for a Town government was working overtime to complete work to place protective large boulders along a vulnerable causeway. The following photograph shows a place where large equipment has been placing stone to protect the second of two causeways on Gerard Drive. 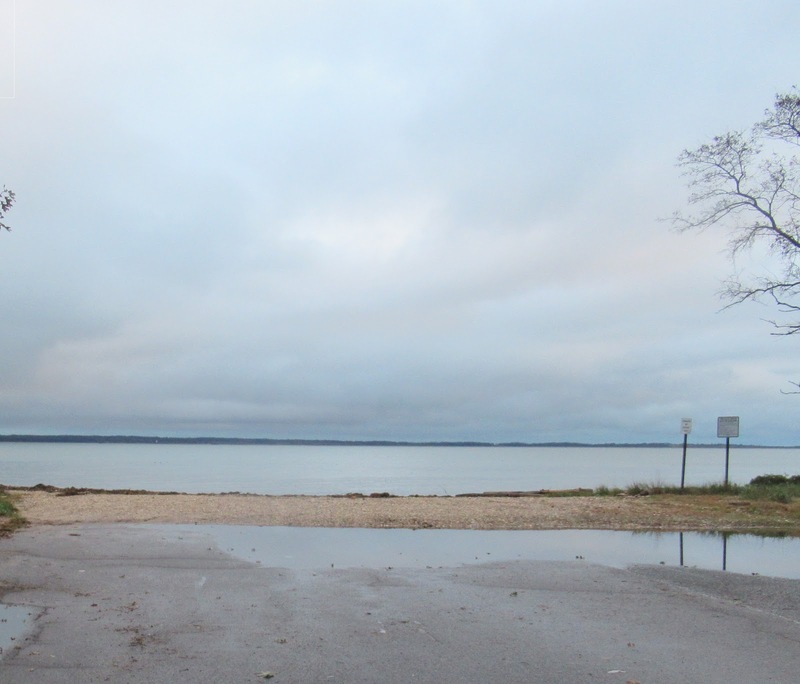 But notice that the water in the photo is flat and deceptively calm. On television in the days before a storm, it seems the news and weather people draw morbid energy from the impending disaster. But in the case of this Nor’easter, their concern was warranted. Saturday morning arrived with a roaring at my mother’s house. The sound came from wind in the trees and high waves in the bay five minutes from her house. Out in the open, the rain was heavy, and the wind was the strongest I can recall. On a reconnaissance trip to check the progress of the storm, large waves were breaking on the protective rocks along the first causeway on Gerard Drive. But on the second causeway, the score was “Gardiners Bay 2, causeway 1”. The causeway was still there but it was covered by big waves and the Town Highway Department was soon out with cones and a truck to close the road. Having the Highway Department watching the roads and protecting motorists was most appreciated. During past Long Island Nor’easters, and hurricanes, many places lost power because trees knocked down power lines. Since Hurricane Sandy, the Long Island Power Authority (LIPA) and PSEG Long Island have been better about cutting limbs and trees that could fall on power lines and cut service. During this Nor’easter, the lights in my mother’s neighborhood flickered twice, but stayed on for the entire storm. Thanks, LIPA and PSEG! On Sunday, the weather was sunny with a slight breeze. As the photos below show, the raging waves of Saturday had changed to calmer rolling ones. The Town had closed Gerard Drive. But in my mother’s neighborhood the main evidence of the storm included big puddles and downed tree limbs and leaf clusters. During a walk on the beach, I looked out and saw something sticking from the water that initially looked like the dorsal fin of a large shark. The large something was moving slowly along the beach. When a wave came along, it moved tantalizingly closer to the beach - - but then bobbed back out. Since it was low tide, I decided to wade in and get the object. While the beach in this place shelves off gradually, the object was, of course, in deeper water than I thought. 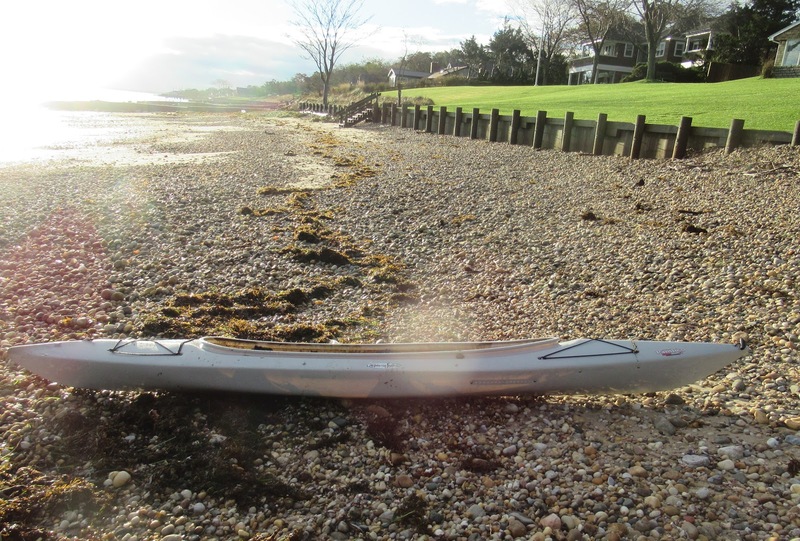 I pulled it in and discovered it was a kayak. I got the kayak onto the beach and away from the water’s edge. Perhaps the owner will spot it there, or someone else who likes boating will adopt it. Also, while walking the beach, I saw some colored things bouncing in the water, in a way that was reminiscent of bouncing lottery balls during the nightly drawing. I went into the water; the “colored things” turned out to be 10 golf balls. The Town reopened Gerard Drive and life has gone back to normal in my mother’s neighborhood. Elsewhere on Long Island, people were not as lucky. 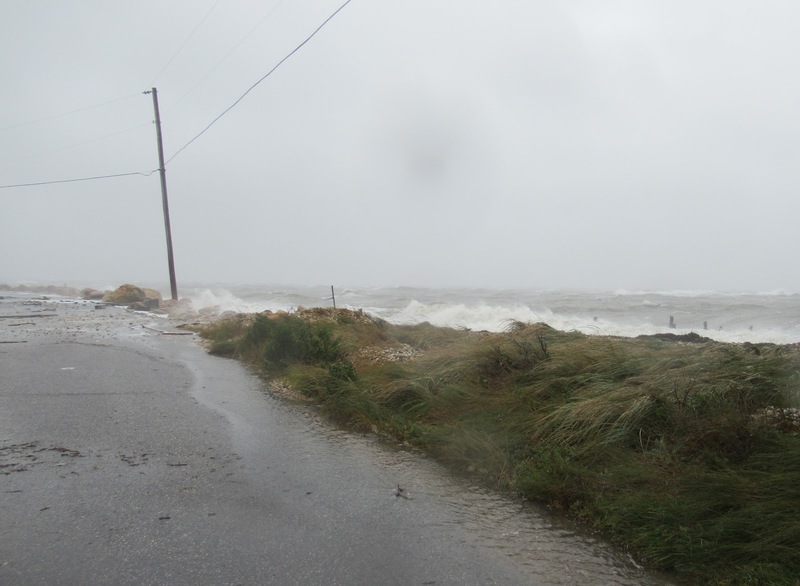 A road segment collapsed in Orient Beach State Park and there was big flooding in Freeport on the South Shore.